Michał Żłobecki is a student at Jagiellonian University in Krakow. He is specializing in international public law, especially EU Human Rights Law. 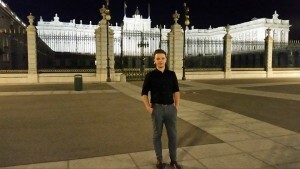 In 2015 he joined the Academy of Young Diplomats, an annual programme hosted by the European Academy of Diplomacy in Warsaw, and he opted for the International Security course. For many years Michał has been involved with various charities and social projects. He organizes a number of cultural projects. One of his main responsibilities is the coordination of projects concerning his academic society. In his hometown, Radom, he used to give lectures to high-school students about providing international security to immigrants in Poland. In the academic year 2014/2015 he belonged to the Jagiellonian University Human Rights Section Law Clinic. He combined his scientific interests with this passion for unpaid legal aid, while gaining valuable work experience. One of his duties was monthly visits to the refugee centre in Targówek, a district of Warsaw, where he provided legal aid, especially for people trying to obtain refugee status. In his free time Michał likes to travel. The language and culture of Spain are his biggest interests. In 2013 he took part in the student exchange programme “Work & Travel” in the USA, where he met a lot of new people and improved his English language skills. Since the beginning of October Michał has been taking part in the Erasmus+ programme at the European Foundation of Human Rights. This will have a great impact on his future career path thanks to it involving taking a closer look at the situation of national minorities in Lithuania. This acquired knowledge will be used in Michał’s master thesis about European ways of protecting the law related to a national minority group’s language under international law.